From February 25 to March 11, Dark Souls 2 will spring back to life. That's the plan, at least. Illusorywall is a prominent figure in the Dark Souls community, primarily for testing "obscure and debated mechanics" and "cut content or other oddities" on their endlessly fascinating blog. Seriously, I've never been so transfixed by floating doors and out-of-bounds exploration. But Illusorywall is also the human embodiment of a bonfire, organizing mass community events. This time, the pitch is a return to Dark Souls 2, an attempt to repopulate the servers with enough players to give the impression of launch populations. There's no real catch or qualification for joining in. 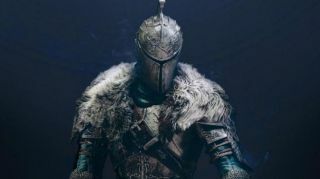 Just pop onto whatever version of Dark Souls 2 you own (though Scholar of the First Sin is encouraged) between February 25 and March 11 and use the multiplayer functionality as much as possible. Illusorywall's announcement tweet lists a few pointers to send folks in the right direction for easy access to PvP and co-op options, and encourages plenty of message ratings too. It's about time, I say. With Dark Souls 3 nearly a year in the rearview and coming to a close with its final DLC in March, what better time to revisit the most divisive game in the series? Personally, I'm looking forward to giving it another go to invigorate my personal ranking of the Dark Souls series with some healthy context. And I haven't played through Scholar of the First Sin yet. Who's with me?